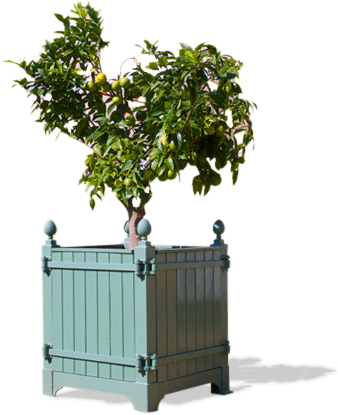 “LE NOTRE” or “ROUBO” orange tree boxes are the perfect citrus fruits planters for your parks and gardens furniture. Your potted trees (orange trees and other citrus fruits) will be be only promoted! (Anduze pot, orangery and other citrus fruits tree). the 1760 Bench (5 and 6 ft) which is inspired by benches from the 18th century, and the Brissac garden bench (customizable on demand). “La Forge Saint-Alman d’Anjou” proposes other items or parks and gardens furniture: paths and flower beds edges (made in steel) to reduce the burden of maintenance, or aluminium rake for a raking in record time. Everything always begins with a garden. This one wasn’t the Garden of Eden, but a fallow land in the priory’s shadow of the 15th Century and the Saint-alman chapel put up in the 11th Century (French ISMH listed) in the middle of the Anjou. The masters of the place decide to restore it in 2000 and give back its charm with the creation of a French garden. The family wanted to create a clever mix with green carpet, flowers and vegetables which was decorated with trimmed box trees: it’s a blend of elegance and bonhomie comparable to those of earlier times in France. Then came the time to plant orange trees and other lemon trees. The landlord measured the manufacturers of orange tree planters and concluded that If you want something done right, you have to do it yourself! He drew boxes of his dreams and entrusted the realization to his own metalwork company in Cholet. But the world is small for parks and gardens lovers. Some friends came to admire these famous boxes and claimed the same ones for their gardens. Today, orange tree planters from “La Forge Saint Alman d’Anjou” beautify gardens among the most attractive everywhere in France, and now extend across national borders. Their success is mainly due to the reproduction of authentic models of the 17th and 18th Century and to their meticulous craft realization.